Day in and day out I face this type of sentiment from various clients (pictured above). By no means am I saying a company shouldn’t hold true to the primary forces or objectives that make them unique and successful in their respective markets, but rather that they should think differently about how to better conduct their business? …the list goes on an on! The bottom line is, in today’s market you must adapt quickly or you wither and die. Adapting also means you are taking advantage of all the options available to your business – and unified communications and collaboration (UCC) is one such option. Unfortunately, it’s one that is often overlooked, yet the benefits of solid communication within your organization is boundless – you just need to know how to prove it. Getting the Most Out of Your UCC Investment? Many companies invest in UCC today with the hope of “increased productivity” or “X, Y, Z metric avoidance” but the fact remains that real, end-to-end UCC is expensive. This isn’t a bad thing – far from it; UCC helps in many ways it promises to and more. This seems like a simple question, but the complexity lies in the fact that most organizations don’t fully understand the impact the technology is having. Metrics for adoption, productivity, or optimization are not easy to find and pull together. I get to help uncover those secrets for my clients. By using the data from their UC environment and combining with their business intelligence data, they can better understand their end user, adoption, and invest with more insight than ever before. Vyopta’s vAnalytics monitors more than 150 Million video calls, and500 Million minutes of video communication across a variety of vendor solutions (e.g., Cisco, Microsoft, Pexip, Polycom, Acano, Vidyo, etc.) every year. Currently, Vyopta helps over 3 Million users across 50 Million meetings per month ensure their video conferencing experience is without issue. This puts me in a unique position to help address adoption and quality concerns for our clients. Simply put, we help you do more with your UCC investment. Vyopta clients who leverage Vyopta vAnalytics have reported a 95% better user adoption rate without requiring additional spend. In fact, our customers often find themselves saving six figures or more by leveraging unique insights to better allocate their existing infrastructure. As you can imagine, this is powerful information to any size company who has embraced UCC as a functioning component of their day-to-day communication. Honestly, I really enjoy helping my clients realize the power of UCC and the impact it has on their employees and their business. Part of that power comes from understanding what new technologies are doing inside and outside their business. Data offers you the ability to look past the anecdotal surveys or “guesswork,” and compare true trends and usage to your investments. 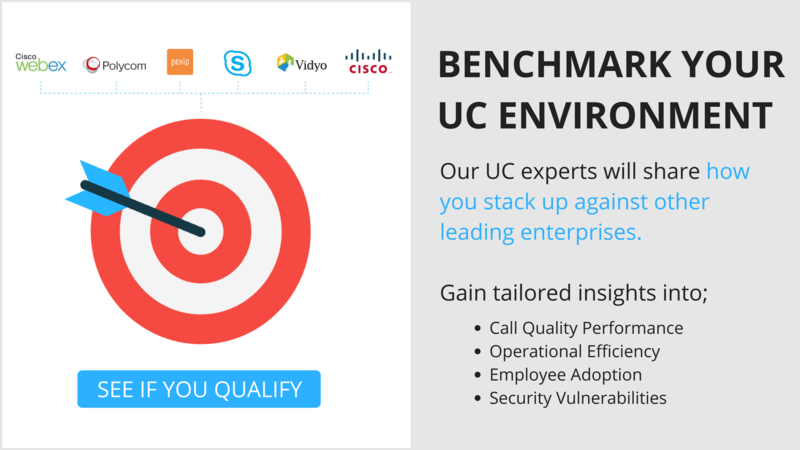 Vyopta’s UC Assessment is a straightforward & painless way for companies to evaluate their current UC investment, and more importantly; better plan for their future. I challenge you to think differently, take calculated risks, and never let “we’ve always done it that way” be part of your thought process again. Shoot me an email at steven.talafuse@vyopta.com, I’d be happy to help you get the metrics you need to get more out of your UCC environment.